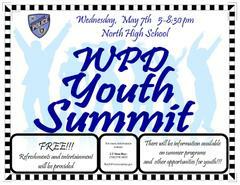 On Wednesday, May 7th, the Worcester Police Department will hold its 10th Annual Youth Summit at North High School from 5-8:30 PM. The event is designed to help students from all grade levels find community resources such as summer camps, youth groups, social and educational services and internship/employment opportunities. The WPD Youth Summit is the largest free event for teens in the city and seeks to prevent youth violence by getting students involved with positive activities during the summer months. Youth serving agencies citywide will gather at the expo-style event to present information, recruit and/or sign up students for activities. The majority of summer programs target middle school and high school students. Worcester Police Chief Gary J. Gemme organized the first Youth Summit in 2005, in response to an uptick in youth violence. Chief Gemme viewed the event as an approach to help get teens off the streets and away from crime and drugs. Each summer, the Youth Summit has been successful in engaging hundreds of students in positive activities that teach life skills, and provide an environment that builds upon their self-esteem. Last year, more than 500 students in the city signed up and participated in programs offered at the WPD Youth Summit.